Sorcerer Radio celebrates its 12 year anniversary this week and the crew invites you to celebrate with them by check out their new EXTRA MAGIC HOURS programming! Due to popular demand of their hosted shows from all corners of the world the station is expanding their DJ presence. All of the evening shows mentioned will be followed by the Nighttime Spectacular at 9pm/e and Bedtime Disney from 10-2am/e. Download FREE Sorcerer Radio apps for your mobile device or stream from SRSounds.com or Live365.com! Sorcerer Radio was started as a way to bring a little bit of that Disney magic back home with you when you are needing a Disney fix. Our goal has always been to provide a special place for Disney fans and families. A place where you can remember your trips through that nostalgic feeling you get when you hear the wonderful music that is played at the Disney parks. 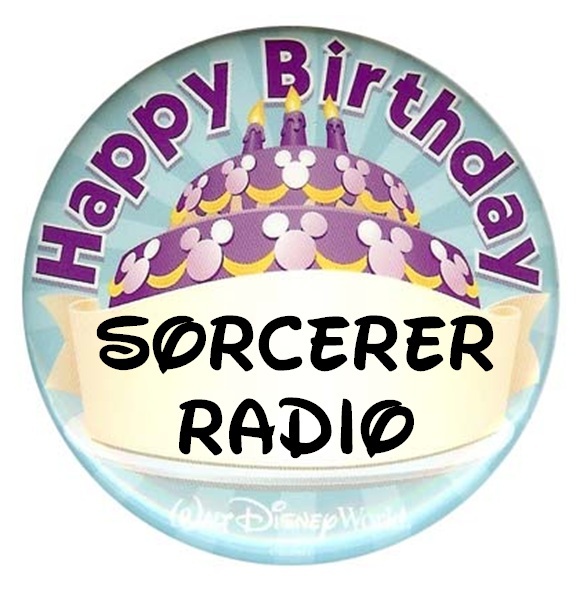 And we have you, the fans of Sorcerer Radio, to thank for 12 years of magical music. From all of us here at Sorcerer Radio, Thank You for letting us provide your Disney fix for 12 years and here is to many many more! Sorcerer Radio is the fan-run, award-winning internet radio station that has been entertaining Disney fans for over a decade! With many weeks worth of Disney park music and attraction audio, you can easily be transported to your favorite vacation destination anytime, while at home, work or on the go. LISTEN NOW at SRSounds.com!